Derek trained at Newport and joined Marconi Marine in March 1968. He spent the mandatory 6 months as a junior R/O on the Harrison liner Naturalist and Ben Line’s Benarmin. 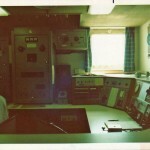 He then spent the best part of the next 2 years on P&O passenger ships albeit still employed by Marconi. 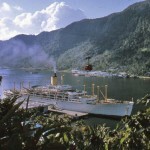 Note: P&O went directly employed throughout the fleet with their own R/0’s in early 1970 (date tbc), but some Divisions had employed directly for some time. 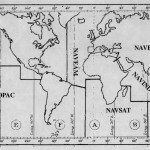 Many of the R/O’s working with Marconi on P&O ships transferred over. Derek and Tony Selman both joined Oronsay in early December 1970 and spent the best part of 18 months on that ship before we both left and then took the first part of the city and Guilds Marine Electronics Certificate at Brunel in Bristol. At the end of that Tony married an ex Woman Assistant Purser from Oronsay and Derek was his best man. We went our separate ways within the fleet only meeting again for Derek’s own wedding in 1974. We have not met since although we are planning to do so.Derek had a long career both at sea and with P&O. 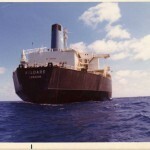 He sailed on many of the company’s tankers, OBO’s and gas carriers. He came ashore in 1986 after nearly 18 years at sea. The photos in this section reflect Derek’s time at sea and to some extent his shore career. In Derek’s own words the rest of his career. 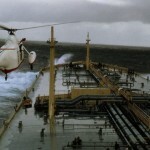 “I came ashore in 1986 and worked for the P&O Group via one of their wholly owned subsidiaries. Three Quays Marine Services was a group within that providing technical services such as naval architecture and safety consultancy and electronic support/consultancy. These were through the three companies of Three Quays Marine, Marine Safety Services and Peninsular Electronics Ltd (PEL) and its sister company Broadgate Ltd. I came ashore initially with PEL and was based in London for 2 years. Then when Broadgate Ltd was started here in Bristol I was relocated. PEL then became the Accounting Authority only (GB06) and Broadgate took on all the technical work. P&O sold all their interest in shipping in 2004 and Broadgate/PEL were taken over by (then) Marconi Marine. I took redundancy and did some consultancy for a few years before the recession bit and nobody wanted consultants. The rest as they say is history”. Appropriately for ex R/O Derek has lived for many years in Portishead and is retired there. Let’s start Derek’s collection off with a ship that a couple of ROA members know well. P&O Liner Oronsay/GCNB. 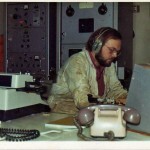 A VERY young Derek Rice sat at the W/T operating position in 1969. Tony Selman spent about 18 months sitting in that chair as well and spent innumerable hours hammering away on that self same typewriter. Spot the difference. There have been a good few R/O’s sat in that seat but to the best of my knowledge none of them ever looked like that. She is not even in uniform so she must have been taking press on the midnight to 04.00 watch then. Note for non P&O people: the only watch in which you were allowed to not be in uniform. Ah, an R/O in uniform. Well almost in uniform and as this is the 3R/O’s cabin on Oronsay the lady must be an R/O otherwise why else would she be there? 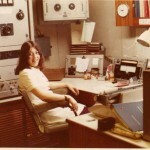 Oronsay/GCNB at Pago Pago in American Samoa in January 1971. 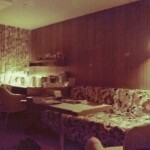 This photo was taken by Tony, and the now Mrs, Selman whilst Derek Rice was on board, probably drinking. P&O /Trident Tankers Ottawa/GNDU. A rather grubby boiler suit so Derek has obviously been hard at work. 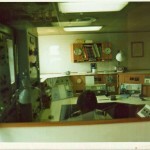 Derek advises the Radio Office was just aft of the wheelhouse, but it was quite a large room and in common with all Trident Tankers (i.e. 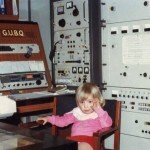 P&O) at the time, had quite a large workshop just off the radio office itself. The photo was taken from the entrance to the workshop. Ottawa was one of four ‘O’ class ships, but was totally different from Orissa, Orama and Opawa with it being the only steamer. Used to shake itself (and all equipment) to pieces when running at full speed – and she could reach 19 or 20 kts flat out, albeit for a short time before we came to a grinding halt! Naturally the vibs caused loads of problems all over the ship. Radio Room: Irfon/GOUV. 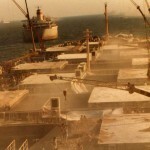 P&O Bulk Shipping Division OBO 150,000 dwt. One of the ABC ‘Hunt’ class OBO’s. The Irfon Hunt is in the Towy Valley in West Wales, near Derek’s home town of Carmarthen. Note the pretty good (P&O standard) level of equipment for the time & class of ship. EB1500 main tx; O’Span VIIE Em Tx. Redifon R408 Main & Em Rx. 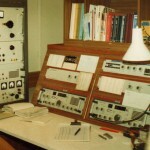 The lower panel to the right with the Nixi Tubes is the synthesiser which allowed free choice of frequency – a great aid to contacting GKA. Radio Room: Ottawa/GNDU. Christine, the future Mrs Rice, occupying the hot seat. Unusual to see an Atalanta still in use on a P&O ship at that time but she had not got that much longer to go. 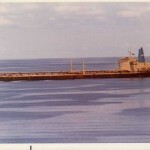 Taken in Falmouth dry dock in November 1972. Ottawa in a bit of a blow. Average speed of 8 knots. 16 knots for one day and stopped all day the next. She was a lot nicer to be in than the other three in the ‘O’ class – Orama, Orissa & Opawa as they were motor ships and really did shake themselves to bits. 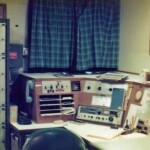 Radio Room: Kildare/GPAK. 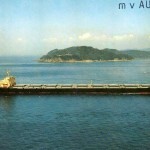 P&O Bulk Shipping OBO 150,000dwt. Another ‘Hunt’ class ABC OBO. The Kildare hunt is, as you would expect, in Co Kildare, Ireland. 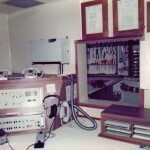 Radio equipment is quite comprehensive and very similar to all P&O built ships at the time. 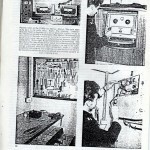 They later went to full redundancy with the Main tx introducing two ST1400’s then latterly two ST1600’s plus an emergency transmitter, usually an Oceanspan VIIe. Kildare/GPAK, the blunt end, literally. Broken down somewhere and testing the lifeboat. 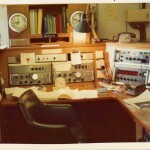 Kildare/GPAK: These MF/HF antennae were made by the German firm Diekman & Klapper. Whilst they were generally good, if you had a problem it was a real pain to get them lowered and fixed. 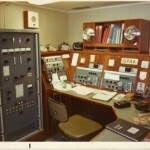 Wheelhouse of Kildare/GPAK. Clearly visible are two Decca Transar radars which were a common fit on P&O ships at the time and were extremely reliable. 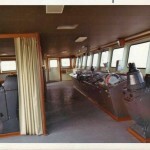 This design of wheelhouse was pretty much standard on large P~&O ships at this time. Trident Tanker Ardtaraig/GYLB. Photo taken in Mozambique Channel by Tony Selman who was southbound fully loaded on sister ship Ardvar/GYKY. 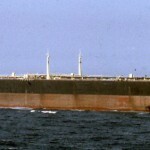 There is no blurring in the photo because Ardvar was steaming at 6 knots due to the 70’s fuel crisis. It takes a long time to get from The Gulf to Rotterdam round the Cape at 6 knots. Derek carrying out scanner maintenance on Ardshiel. It was a very long way up to the top of that radar mast but you used to get some very good VHF reception with the aerials set that high.This photo completes the set of all 4 Ard class tankers. 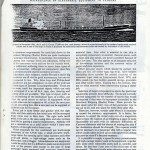 Ardshiel was the subject of a very well known book in the 1970’s called “Supership” written by Noel Mostert. Why doesn’t the X Band radar work? Spot the problem. Derek says: Note the lack of waveguide which had [allegedly] been washed away in a particularly nasty Southern Ocean blow! Taken around 1985 when I went to fix it! P and O BSL bulker Aurora/GUSS. 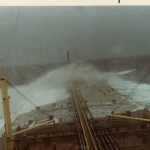 There were a few spare lengths of waveguide on board as the ship was notorious for shaking itself to pieces, but nowhere near enough to get this one running again. Had to fix the S-Band and then slave the two displays from that transceiver. We replaced the whole X-Band waveguide run from turning unit to transceiver with new-fangled flexi stuff when we got to Rotterdam. See, some Junior R/O’s did do some work. Mike Smith at work on P&O OBO Aurora/GUSS. Derek was Senior R/O. Aurora/GUSS loading tapioca in Koh Sichang, Thailand. 150,000 tons all loaded by hand over about a 3 week period. The dust was all pervasive. P&O 150,000 OBO Aurora/GUSS. 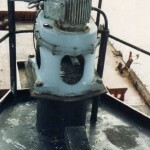 A ship with very serious vibration problems causing sensitive equipment to fare badly. 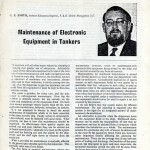 Article written by P&O Radio Superintendent Glyn Smith for the “Tanker Directory of the World” in 1963. Glyn was very well respected and liked both within P&O and also the wider radio community. Derek regarded him as his mentor when he came ashore. 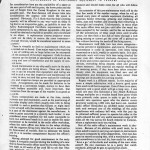 Although the reproduction of this article is not great (scan of a photo copy) it has been posted because it was very forward thinking for it’s time. 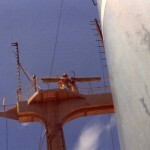 Glyn was sent to Japan to supervise the building of the four Ard class VLCC’s at Chiba in Japan. Tony Selman stood by the final 6 weeks fitting out of Ardvar, the final ship in the class. He was made very welcome by the extremely professional Glyn who hosted him well and insisted on introducing him to Glyn’s new love, the Yomiuri Giants baseball team. 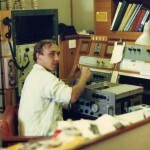 The standard of radio and electronics fit on the Ards was very high due in large part to Glyn’s presence. He died, too young, of cancer in 1989/90. 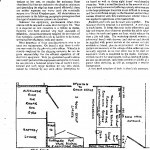 Glyn smith article – section 4. The photos have not reproduced very well I’m afraid. 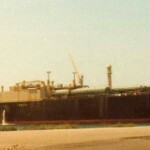 P&O gas carrier Galconda. This was one of what were called ‘The Big G’s’ and were approx. 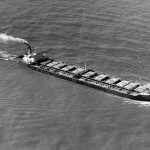 44,000 tons dwt. A not particularly good photo of the R/O’s accommodation on Galconda. Radio Room: Gandara/GUBQ. The lady R/O is Derek’s daughter Helen. 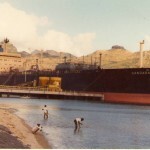 Gandara/GUBQ alongside in Port Louis, Mauritius. Photo courtesy ex P&O R/O Clive Kaine. 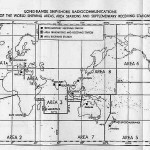 Area Scheme map. Almost all of us must have worked the Area Scheme at some time. I was very interested to see the pictures of you on Oronsay. 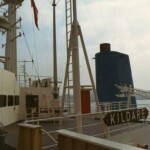 As you may recall I sailed on Oronsay from 1967 to the end of 1969. 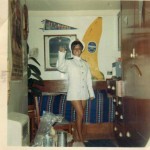 I sailed with you during 1969 and possibly before that I believe, we had adjacent cabins. 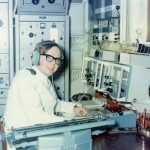 I have a photograph of myself at the operating position which looks exactly like yours. 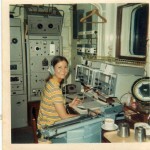 I also have a picture of myself in my cabin operating maritime mobile with my FTDX400 transceiver. Fraternising with the passengers? We don’t want that kind of talk on this site. Come on Geoff, you know full well this is a respectable and professional site that is here only to recall the equipment and vessels we sailed on. There will be NO smutty inferences and anyway R/O’s on passenger ships were too busy and too tired after coming off watch to become involved with socialising with young ladies. It was against regulations anyway and the wonderful phrase as quoted by John Garner sums it up: “In Blue Funnel you were not allowed passengers in your cabin, it was regarded as Broaching Cargo.” Beat that for terminology! on the passenger ships had it all on a plate!! Jealous – you bet! !